NASSAU, The Bahamas – The Ministry of Labour introduced three major initiatives to help fulfill its mission to promote employment opportunities for Bahamians at a press conference at its offices, January 8, 2018. Minister of Labour, Senator the Hon. Dion Foulkes said, "The objective of these initiatives is to make it as easy as possible for job seekers to be successfully matched with the available job opportunities, and to bring about an awareness to our Public Employment Services (P.E.S.)." Minister Foulkes informed the press: firstly, a seminar would to be held immediately after the press conference from 10 a.m. to 2 p.m. so that Human Resources Managers throughout New Providence could have the opportunity to become familiar with the new PES website, PCRecruiter. The Ministry anticipated 40 plus employers will be engaged and become familiar with the PES officers and the services that PES can provide. The website provides employers with access to the resumes of Bahamians locally and internationally and provides opportunities for employers to upload job vacancies directly to the website. The Ministry Labour can also provide employers with a space to conduct job interviews, off-premises, as well as assist with conciliation matters. The second initiative will take place on Saturday, January 13, 2018 from 11 a.m. to 3 p.m. at the Sarah Ingraham Park, Hospital Lane, called "Labour on the Blocks." Minister Foulkes said the aim of this initiative is to "target job seekers who may have given up on finding gainful employment or may not understand the avenues they should take to secure employment." The Ministry’s PES Unit will meet individuals in their own neighborhoods every month this year beginning with Bain and Grants Town. PES Unit Officers will be registering individuals on-site. The third initiative introduced by the Minister was a "Construction Job Fair" scheduled for Saturday January 20, 2018 at the Kendal G.L. Isaacs Gymnasium from 12 noon to 4 p.m. A total of 20 construction companies have confirmed participation. Job seekers in this area are encouraged to come out and be interviewed on the spot. 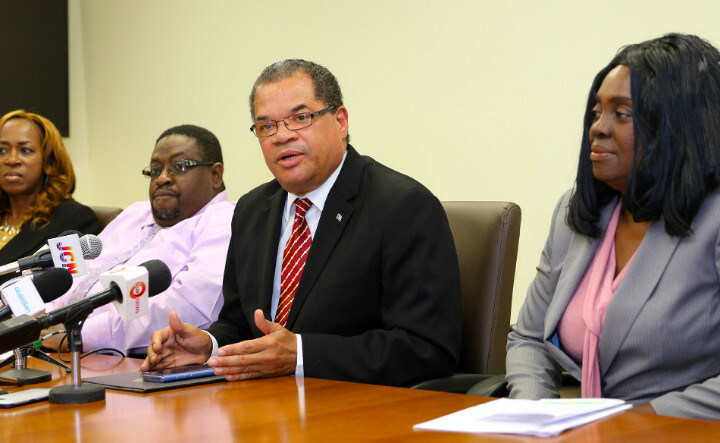 Minister Foulkes noted, "No longer will the traditional methods of job seeking and employee engagement be the only source of job placement,"
Press conference participants included Director of Labour Robert Farquharson, Assistant Director Janet Russell, and Ministry personnel, Patricia Rolle, Bonnie Johnson.